Throughout its history Hallmark Cards has engaged a number of prominent contemporary artists and designers to create original works for its printed products. 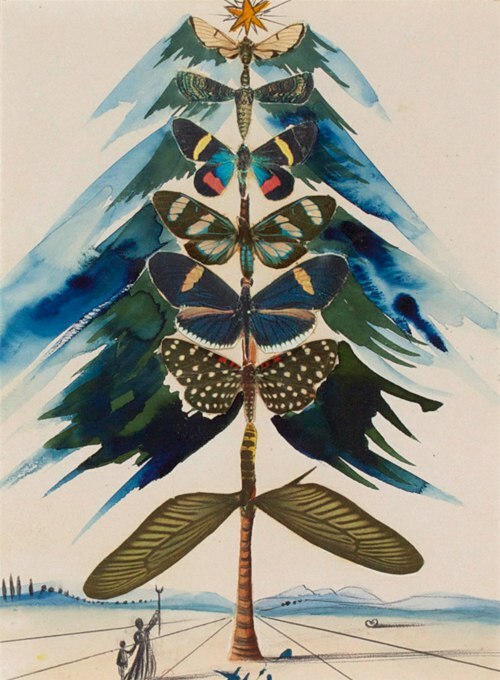 Among the most radical partnerships was with the visionary Salvador Dali, who painted works on a number of holiday themes during the height of his international fame. Born in 1904 in Figueres, Spain, a rural town that lies near the French border, Dali displayed an early propensity for art, experimenting with various painting methods during his youth. He quickly developed his own highly mannered style of figuration that featured landscapes populated with fantastical elements such as melting watches and burning giraffes. In 1929 Dali joined the Surrealist group of artists and writers based in Paris who were likewise interested in free association and the subconscious realm of dreams. Adept at self-promotion, Dali became the public face of the Surrealist movement internationally. In addition to making paintings and sculptures, he collaborated with director Luis Buñuel on experimental films filled with dreamlike and disturbing imagery. However, Dali’s art and personal politics evolved, leading to his expulsion from the Surrealist group in 1934. As World War II approached, he and his wife Gala fled to the United States. Dali’s fame grew, aided by his increasing amount of work for American corporations. While in America Dali also authored his first novel, Hidden Faces, and an autobiography, The Secret Life of Salvador Dali. His myriad professional ventures and personal appearances were closely followed by the American press. Dali’s dramatic flair and bizarre antics helped to create a mythic persona that has become inextricably linked with his art. Dali returned to Spain in 1948, but for many years to come, continued to spend part of each year in Manhattan. He increasingly turned to scientific and religious subject matter, finding a mystical connection between the two. 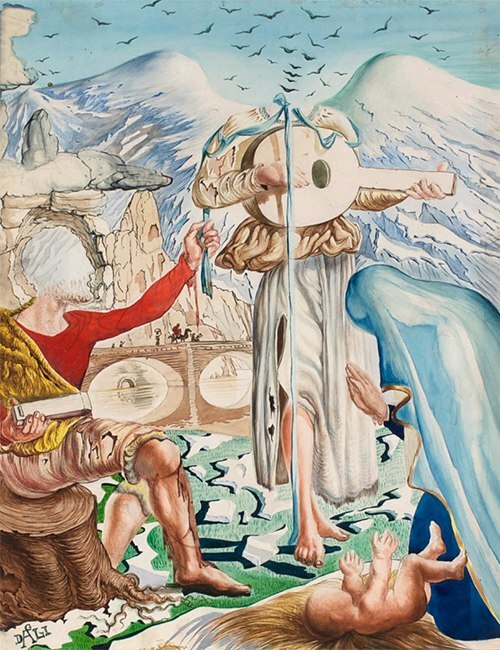 Upon his death in 1989, Dali donated his art to the Spanish people, much of which is housed at The Dali Theater and Museum he designed in Figueres. 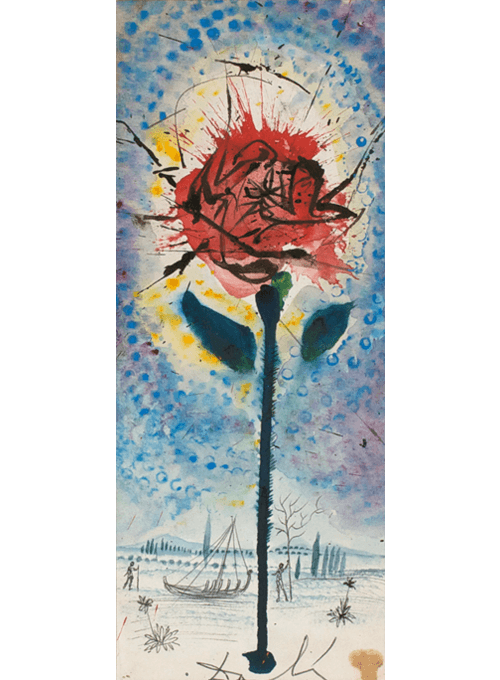 The Hallmark Art Collection contains thirteen original works by Salvador Dali, most of which were commissioned for greeting cards. 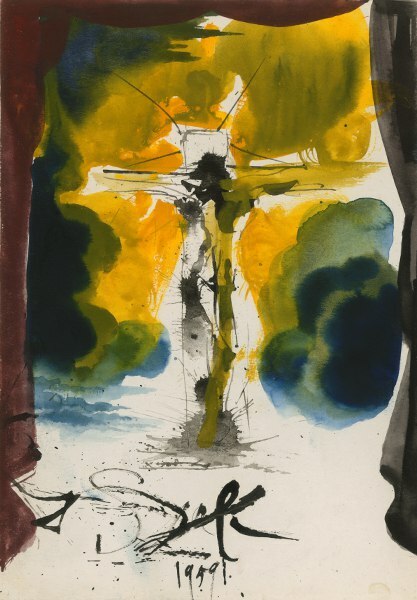 Salvador Dali was one of many modern artists who fled persecution in Europe as World War II loomed. He and his wife Gala emigrated to the United States in 1940, dividing their time between New York and California before returning to Spain in 1948. During these years Dali was especially prolific. As a Renaissance man, I do not consider myself separate from the masses because I am an artist. I am ready to design whatever people want. 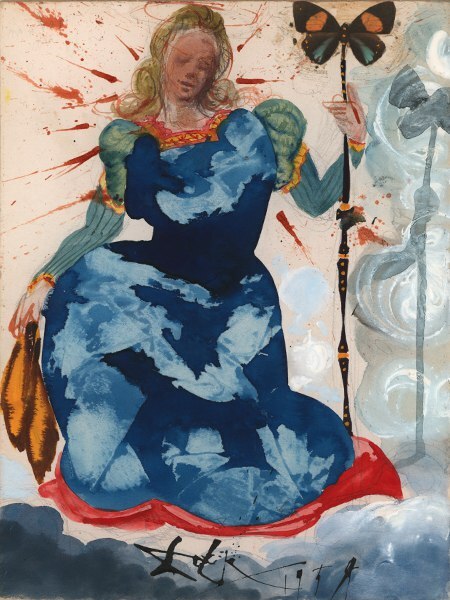 While his paintings were being exhibited to great acclaim at the Museum of Modern Art and other prestigious venues, Dali expanded his artistic practice to include stage and costume designs for American opera, ballet, and film productions. Among his many theatrical clients were the Metropolitan Opera, Alfred Hitchcock, and Walt Disney, who commissioned the surreal animation Destino. 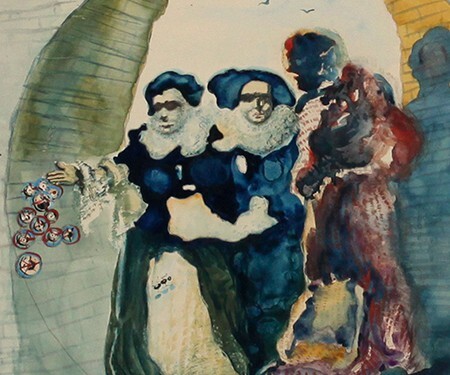 In addition to his theatrical work, Dali designed fashion and jewelry, painted society portraits, and produced illustrations for numerous magazines and books. Seeing no conflict between fine art and commercial work, Dali also produced advertising art for many corporations including Bryan’s Hosiery, De Beers Diamonds, and S. C. Johnson and Sons. 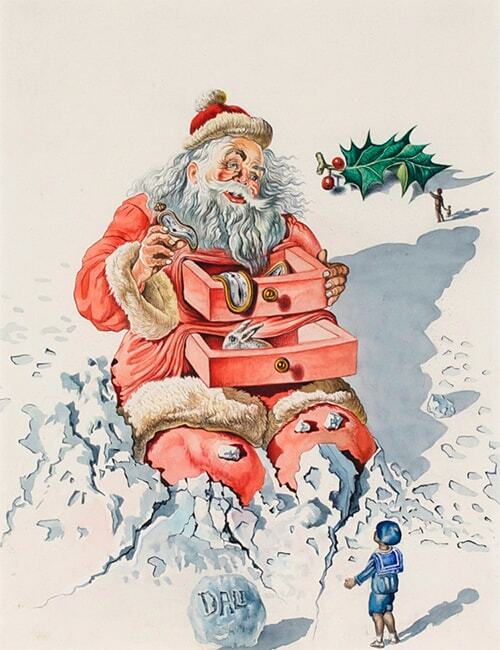 In 1948, Hallmark released its first set of Dali Christmas cards. His myriad creative ventures helped to make him a fixture in the American press throughout the 1940s and 50s. 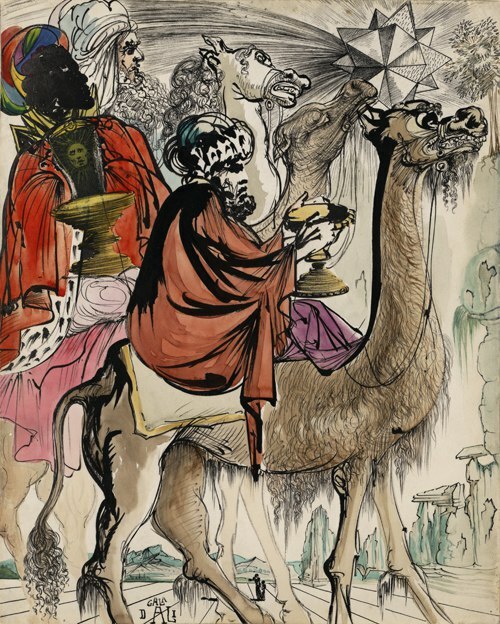 Dali’s dramatic appearance and bizarre antics (such as always referring to himself in the third person) garnered him publicity unlike any artist before him. His outrageous public persona became inextricably linked with his art. In 1948 Hallmark released the Gallery Artists line of Christmas cards, featuring works by artists throughout history including El Greco, Van Gogh, Grandma Moses, and Salvador Dali. 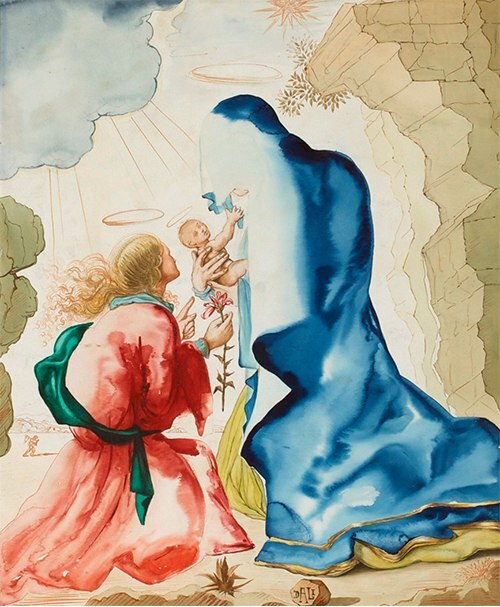 A recent convert to Catholicism, Dali contributed devotional images of a Madonna and Child, Three Wise Men, and an angel. 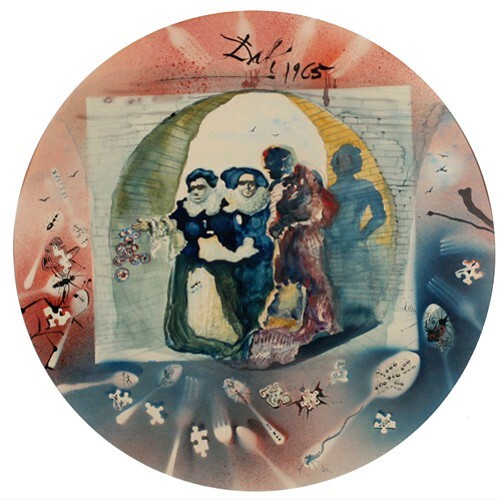 Although Hallmark’s initial venture into fine art was a great success overall, Dali’s images proved a bit too avant-garde for traditional consumers. 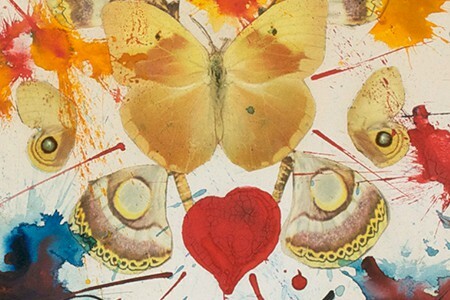 If you study the entire series of cards you will find one theme runs through almost all–the butterfly… The ugly, ungainly caterpillar, our body, enters a form of the grave–a cocoon. Out of this death emerges the butterfly–beautiful, free, no longer earthbound. 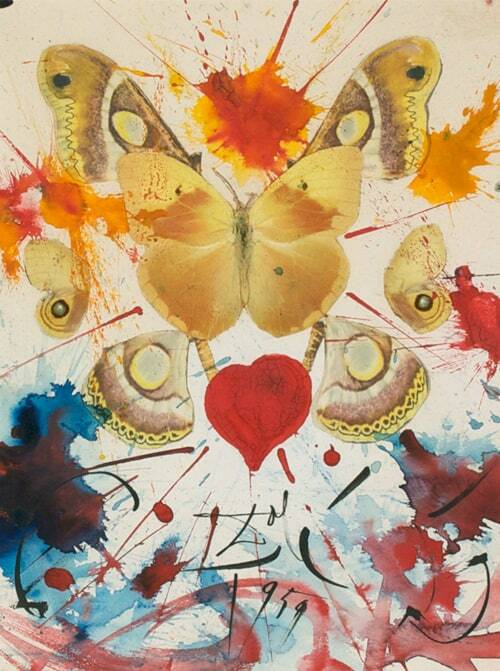 However, ten years later Hallmark commissioned Dali to design a new series of greeting cards. This time, in addition to Christmas scenes, he painted images for Valentines Day, Easter, and Mother’s Day. 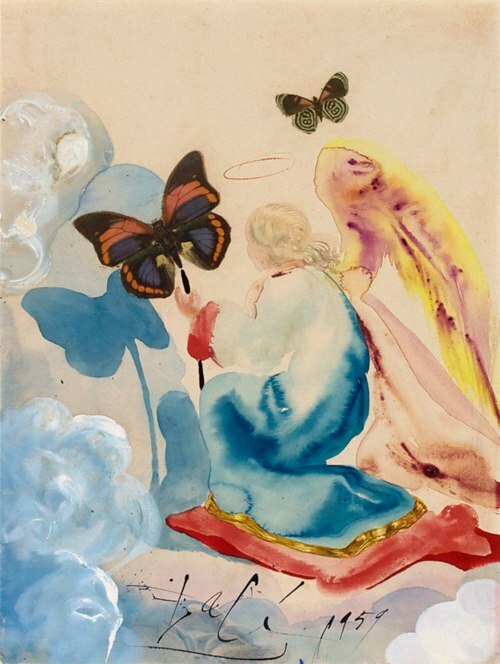 The seven watercolors feature a recurring motif of the butterfly, which Dali described as “a symbol of the soul.” These paintings reveal the increasing mysticism that would guide Dali’s art through the rest of his life. Despite the fanfare aroused by the unlikely collaboration of Hallmark and Salvador Dali, only three of the new designs were ever printed. 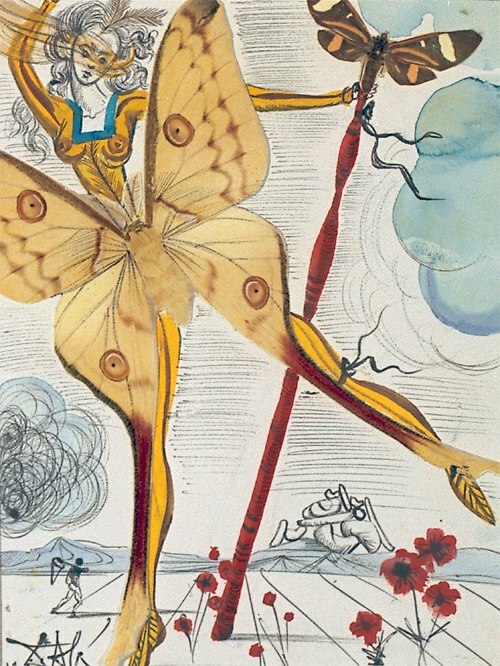 Undeterred, Dali created further greeting card lines for other clients in Spain and France. 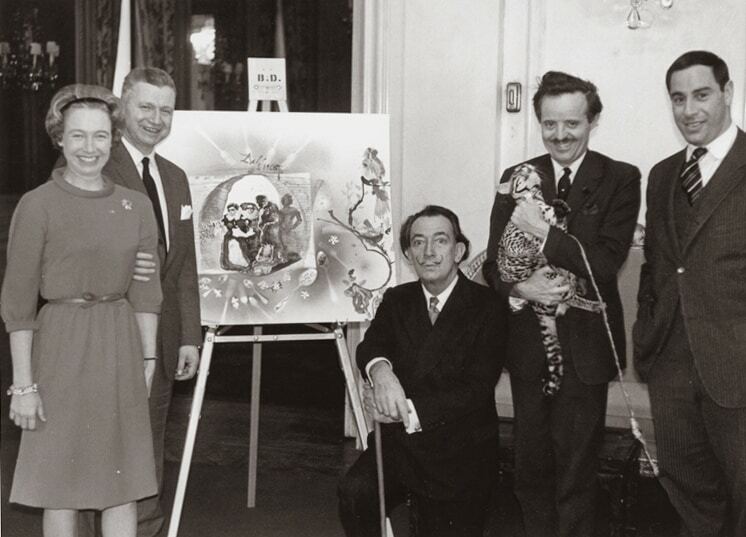 In 1965, Dali embarked on an unusual commercial venture with Springbok Editions, an American puzzle manufacturer that was gaining a reputation for working with vanguard artists. The company contracted with the famed surrealist to create a new work for its popular line of circular jigsaw puzzles. 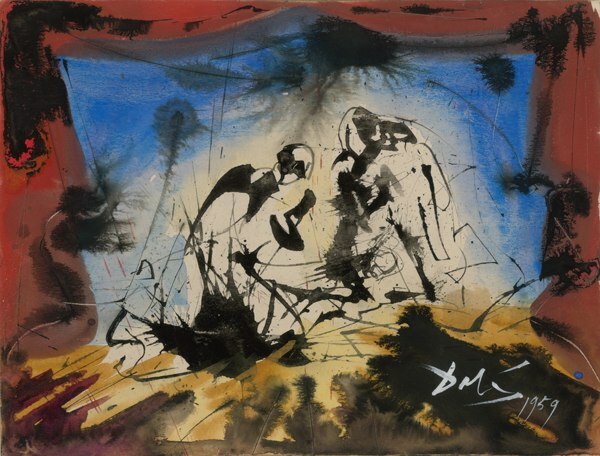 The resulting painting, Double Image, debuted among Springbok’s 1965 offerings. The apparition of Voltaire signifies the apotheosis of good luck. This is indeed the jigsaw puzzle of the magic wheels of fortune and good luck. The central motif of the work is a pair of women whose combined image, especially when seen from a distance, forms the head and shoulders of the French writer and philosopher Voltaire. Dali had already completed two paintings with this double image, which is based on a marble portrait bust of Voltaire by the French sculptor Jean-Antoine Houdin. According to Dali, the apparition image signified good luck, and the scavenging ants, a recurring motif, symbolized life and vitality. Dali attended a well-publicized unveiling of Double Image in New York City, his home for part of each year since his exile in America during World War II. The artist arrived at the event in grand style, accompanied by his pet ocelot, Babou. Hallmark acquired the Springbok company in 1967, along with a number of original art works used in Springbok’s puzzle line, including Double Image. The angel, pure spirit, messenger of God, has dominion over those souls given to his care, as represented by the butterfly scepter. He watches over the soul, seeing that it comes to neither evil nor harm. Every human soul has an angel who guards it in this way. Extravaganza is for Valentine’s Day. It depicts woman—not a woman, but all women—as a butterfly, as a pure soul, ranging free in a universe where men are earthbound stones, represented by the rock formation at the lower right. Since womanhood is regal, she holds a butterfly scepter, representing her rule over the souls of men. . . The card is a tribute to elusiveness, the true freedom, of the real woman. In the writings of St. Theresa of Avila the mystic love represents the mutual love that exists between the soul and God. It is the only love that is timeless and deathless. In the lower part of the painting, I show the skeleton of a ship beached on dead sea. . . Everything here represents the fact that earthly love is doomed to die. Only the love affair between the soul and God is eternal, transitory and deathless. My Mother’s Day painting—“Woman”—represents the mother as a queen, holding a butterfly scepter that represents her rule of souls through her love. . . To me motherhood has an intensely madonnalike quality—beautiful, luminous with spirituality, queenly and noble, containing all gentleness, all generosity, all goodness. The tree stands on the great, bare Spanish plain, which represents–as it does in other paintings–timelessness and eternity. Surely Christmas is the essence of the timeless and the eternal. The two little figures below the tree are my mother, indicating the tree with her butterfly scepter of spiritual beauty and love, and myself as a boy delighting in having her show it to me. – Statement by the Artist that accompanied the 1965 release of Springbok Edition’s Double Image. © Hallmark Cards, Inc.
Dali attending the unveiling of Double Image in New York City. Also in the photograph his pet ocelot, Babou.